We are lately seeing in Vidactio some projects with a clear internacional presence that includes a well-defined segmentation. Well. If that international segmentation is not too precise, we do help our customers in the process. Once the countries are defined, we decide the publications and search engines where we want to be in order to reach our potential customers. And yes, not everything is Google when planning SEO and SEM. Although around 60% of the monitoring and statistics is made using Google tools, the countries where our target audience lives, use other search engines. Along with those search engines, vertical publications constitue a nice source of information for managing our online marketing budget. We can find Yandex in Rusia, Bing for certain niches, Yahoo! 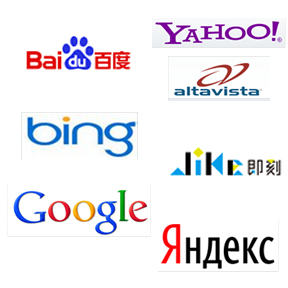 and its trademarks (altavista, for instance is used in northern europe countries), Baidu in China. If you know where your potential customer lives, do not forget to put on their shoes and use the internet the way they use it. Only this way you’ll make really effective campaigns. Talk about this post in your favorite social network, include a link to this post and a link to your comments we'll appear below. Thanks. Take a look at some of the possibilities brought by interactive video on this section. Vidactio ® is a registered trademark of Web Audiovisual Interactiva, S.L.